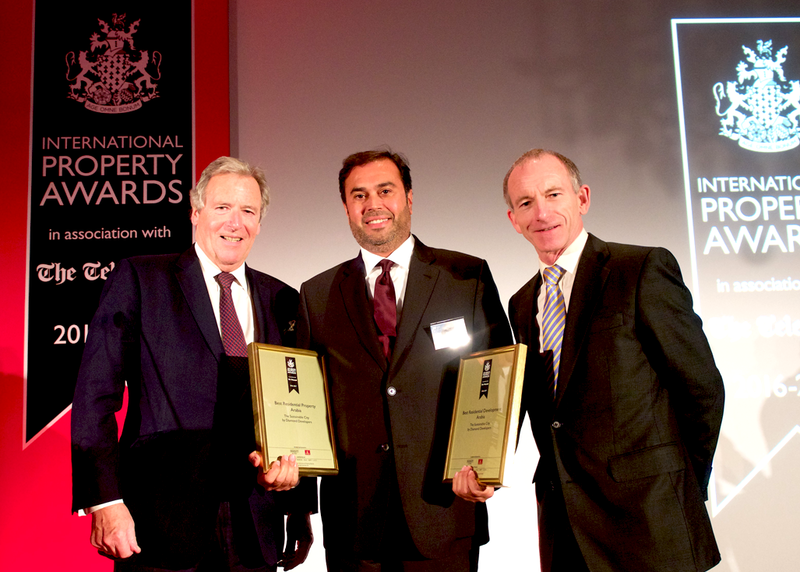 Dubai, United Arab Emirates, 18 December 2016: The Sustainable City – the Middle East’s first operational sustainable development located in Dubai – received the ‘Best Residential Development Arabia’ and ‘Best Residential Property Arabia’ in the Middle East during the world-renowned International Property Awards 2016. The prestigious accolade was presented during a gala dinner and winners’ ceremony held at The Savoy, London. This award comes fresh after the project won best ‘Residential Development’ and best ‘Residential Property’ in Dubai accolades at the Arabian Property Awards 2016. Diamond Developers, the real estate company behind The Sustainable City, was represented by Mr. Wassim Adlouni, Executive Director – who received the honour on behalf of the company. Collecting the award was a moment of pride for Diamond Developers, and certified the great progress that has already been made towards sustainable communities and residential developments in the Arab world. Spread over five million square feet, The Sustainable City has a focus on three elements of sustainability; economic, environment and social. The community comprises of five residential clusters of 100 villas each that feature efficient home design and use of eco-friendly building materials. Each of the residential units is painted using UV reflective paints to decrease temperatures by reflecting Sun rays resulting in a 50% decrease in electricity bills. The villas are also installed with solar shaded rooftop, smart energy efficient air conditioning systems with humidity controls, energy-star home appliances, high efficiency HVAC control (heating, ventilating, and air conditioning), solar water heaters, LED lighting, water efficient fixtures, faucets & appliances that results in water decrease consumption by 40%, and 100% recycling of wastewater using separate grey & black water drainage networks. The accolade will encourage the organisation to increase their essential contributions towards the Dubai government’s flagship sustainability initiatives, as the Emirate aims to become one of the top ten sustainable cities in the world by Expo 2020. The Sustainable City has also received the ‘Sustainable Project of the Year’ at the Construction Week Awards 2016 – held recently at the Conrad Hotel, Dubai which recognises and rewards individual and corporate excellence in the field.